Peter Fitzpatrick returns home to Kirkintilloch with his Czech wife after five years in Prague. Resuming his previous career in banking and financial service, he feels unfulfilled. His application to host a television programme discussing the hot topics relating to Scottish football eventually finds favour. ‘The Scottish Football Debate’, or ‘Scotball’ is born. The show is an instant hit; it tackles the problems relating to the game in a forthright and intelligent manner. It wins praise for being uncluttered by the customary agendas and petty grievances which usually distort and disfigure these types of shows. 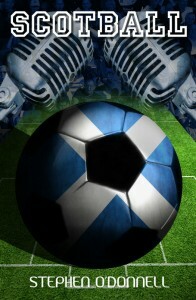 The programme runs successfully for two full seasons, debating and discussing such previously taboo subjects as sectarianism, declining standards in Scottish football and the pejorative influence of finances and a too powerful media on the game, when the biggest story in the history of Scottish sport begins to unfold, namely the financial liquidation of Rangers.